The final part of the Dire, Devilish Deeds-series and part II of the sorcerous gauntlet clocks in at 46 pages, 1 page front cover, 1 page editorial, 1 page SRD, 1 page back cover, leaving us with 42 pages, so let’s take a look! As with all the reviews of modules in this series, at this point I assume you’re familiar with all my previous reviews of this series – I assume you’re familiar with the basic premise of the series and the uncommon and slightly wonky way in which transmutation works herein and the potential rough edges you might encounter. I do assume that you’re willing to tackle these books on their own level and appreciate a more adventure-style gameplay as opposed to what we usually get in a given module. This module continues the brain-teasers of the sorcerous gauntlet’s puzzles and polymorphed combat challenges. From now on, the SPOILERS thus reign – potential players should jump to the conclusion. All right, still here? Only DMs around? Great! The first challenge is pretty easy- use bone tiles to create a sentence…only with a twist. In the last installment, I complained about the forms into which the PCs were transformed – last installment, we got mainly bland celestial animals versus anaimals. Well, this time around, the first combat is PC Hound Archons versus Satyrs – raw damage vs. subtlety – interesting set-up! The next challenge is imho too simple and amounts to a swift letter-changing puzzle. It’s so simple, in fact, I don’t really get how one could possibly fail it, but on the plus-side, the combat that pits the PCs in the skin of bralanis against salamanders makes somewhat up for this. The next puzzle is more interesting – we are presented with a visual representation of a pentagon that contains a pentagram and are challenged to determine the amount of triangles. I considered this one actually pretty interesting in its premise, so yeah – nice one and makes up for a once again bland combat -after the previous ones that sported tactics and various abilities, the reduction of celestial elephants versus dire tigers felt rather bland. On the plus-side, the next puzzle does retain the high quality of the previous one – we are presented with a line of seemingly jumbled letters that can assume two configurations – by moving letters in the right way, one can craft a sentence from nonsense. And yes, in case you haven’t noticed, the puzzles do mirror some concepts traditionally aligned with how one perceives arcane magic to work, so kudos for maintaining thematic consistency. The combat challenge awaiting would pit the PCs in celestial cachalot whale form versus dire sharks – at least the aquatic dimension should prove to be interesting, but still – would have preferred a more interesting set-up. The final puzzle, once again, is pretty glorious, though – we receive 34 letters as tiles, which have to be arranged on a grid to spell out the numerical names of the different levels of magic – the problem being, that the combined letters of those amount to 45. Nice one! Thankfully, the final combat, which puts the PCs in leonal bodies and sees them challenge elder air elementals, once again also can be considered a fitting one. Like the first gauntlet, the letters received as rewards for each bested challenge also double as the (simple) final puzzle, which, after a short respite, offers a way out of the gauntlet. The final aftermath, including the level-dependant treasure is provided in a way that mirrors the end of the first gauntlet…and that’s it. Don’t get me wrong, much like in the first gauntlet’s finale, I loved the final fluff of the section. I enjoyed the puzzles – but the ending of this, the last installment of the saga, feels horribly abrupt. So the PCs have bested these two gauntlets, made point for the supremacy of either type of magic, proven their smarts…and now what? Nothing? Really? Where is the final epilogue, perhaps a comparable tally of success, something to wrap up the gauntlets? Don’t get me wrong, I get the modular nature: “Start with whatever gauntlet you like and ignore the other, run both, etc. – all up to you.” I GET that. But where’s the climax? The conclusion? What if the PCs have aced both gauntlets? Where is the epilogue, the final puzzle, the final test? As written, the end of this saga feels terribly anti-climactic – it just peters out. Editing and formatting are very good, I noticed no significant glitches. Layout adheres to a beautiful 2-column full-color standard and the pdf comes fully bookmarked for your convenience. The artworks in full-color are awesome. The map, which comes with a player-friendly-version, is functional, but not up to AAW Games’ usual standard. The visual representations of the puzzles and their solutions are cool. 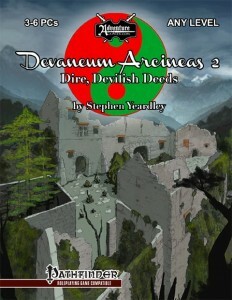 I absolutely adore Stephen Yeardley’s Dire, Devilish Deeds-saga for its innovation, for its completely unique set-up for adventures, for being utterly distinct. If you’ve read my previous reviews, you’ll realize that. However, at the same time, I do feel like the second gauntlet, while upping the ante regarding puzzle-quality, sports the less inspired combat challenges, with some amounting to none-too-interesting pairings – while less pronounced than in the last installment, this one also features some pairings that fall behind in terms of coolness, that feel less “arcane” than they ought to. Still, in this regard, this one surpasses its direct predecessor. At the same time, though, this is the final part in the series. Part 4 of 4. I *get* that one can play the first and second half of this series as stand-alone. I like this modular aspect – but neither installment 2, nor 4 provide a conclusion for anything beyond their own gauntlet – the overall narrative is left hanging, there is no true resolution, no catharsis to be had for the PCs and in a final installment of a series this unconventional, going all out for a final, big square off would have been not only rewarding, but awesome – where is the “Planetar PCs vs. Tarrasque”-climax, the “Elder Elementals vs. Pit Fiends” test? What about a combat of dragons? something like that, something that feels suitably epic. As written, the final challenges of each gauntlet are cool, yes, but then the modules, the whole saga, somewhat peters out. I really thought I’d see the big boom here, but instead, I got a whimper – or rather, a shrug. This does not make this series any less awesome – even as scavenging material, this series is definitely worth its asking price. Still, with the somewhat abrupt ending and the couple of less inspired combats herein, I can’t go as high as I’d want to – my final verdict will clock in at 4.5 stars, rounded down to 4, but I will add my seal of approval. The overall series, mind you, would receive the same verdict as a whole – while I ADORE the uniqueness and premise, the puzzles and puzzle combat challenges, I do feel that the series has some rough edges, could have handled its polymorphing slightly better, could have had more exciting creature-pairings, especially in #3, and the lack of a true ending/epilogue may be jarring for some of you. While I still consider this series important as modules for PFRPG as a whole and worthwhile, even if only for scavenging purposes, I do consider them also to fall short of true excellence, of fully realizing the vast potential that is clearly here – this has the making of a total classic, but as written, its rough edges slightly mar the absolutely superb level of daring and innovation exhibited here. You can get the final part of this puzzle based-series and the second gauntlet here on OBS!